Colgate Professor of Geography and Environmental Studies Ellen Percy Kraly has been named as one of the 2018 WCNY Makers: Women Who Make America, for her work with refugee populations in Utica, N.Y., and at the United Nations. “My teaching at colgate has always been connected communities and introduce our students to community leaders. I try to bring issues of health and demography and environmental studies alive by making them relevant in this region,” Kraly said. Watch the full awards broadcast now on WCNY’s website. Kraly, who has taught at Colgate for more than 30 years, assists locally as a board member of the Mohawk Valley Refugee Center in Utica, and on a national level at the United Nations, where she helps assist with research pertaining to refugees and forced migration with the International Union of Scientific Study of Population. 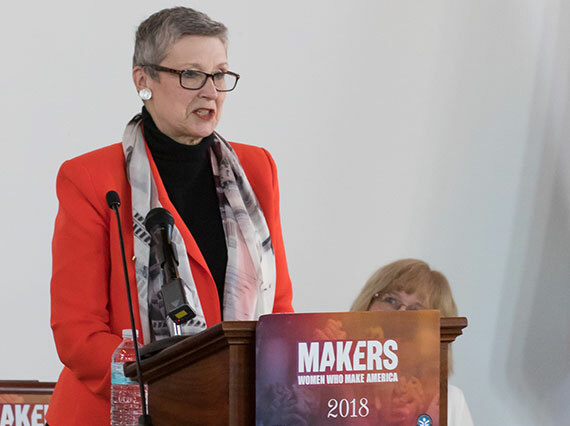 Debbie Stack, senior director of education and community engagement at WCNY said the Makers Award, which is given to 10 women in the 19-county region each year, was created to encourage others to work toward meaningful change in Central New York. “Sometimes, I think efforts of everyday people don’t get cataloged, and don’t get noticed. This is a way to really call some attention to that, and to inspire each one of us in Central New York, to think about ways we can make a difference,” Stack said. Kraly said she also works closely with Shelly Callahan, of the Mohawk Valley Refugee Center, who also earned the Makers Award this year. “To have Shelly, a good friend and colleague, also getting an award, I feel like I’m sharing this recognition with her, and celebrating her good work,” Kraly said.